The coral reef is the most vulnerable ecosystem on the planet and is in danger of become completely destroyed. It is at threat by pollution, global warming, diseases and inhumane fishing practices. Losing the coral reef will leave a huge impact on tourism, fishing industry, and marine biodiversity for hundreds of countries. Antonio M. Claparols, the author of the article, “RP in danger of losing its coral reef biodiversity” says, “The coral reef colonies of the Philippines, considered the "rainforest of the ocean" for their bio-megadiversity, could end up dead and and with them the rich marine life. Most of the fishing in the Philippines is done by using the poison cyanide, which causes the fish to swim in crazy circles right into the fisher’s nets. This poison is squirted into the crevices of the coral. Other destructive methods are also used such as, muro ami, kayaks, trawl fishing. These methods result in 6 percent of the reef to be in good condition and the other 94 percent either dead or in bad condition. Global warming is also another major cause of the destruction of the coral reef. The rise in heat of the water is causing the reef to have heat stroke and if the temperature doesn’t drop most of the coral around the world will die from it. The ocean only has a certain amount of buffer to be able to maintain the pH at the correct temperature. With all the Carbon dioxide from greenhouses gases that is being put in the water, the ocean can not retain the correct pH. 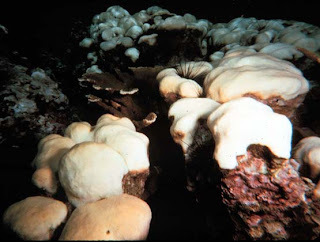 Resulting in the water becoming to acidic, ending in the coral being destroyed. I believe that steps need to be taking to reduce and eliminate the amount our coral reef is being destroyed a around the world. The coral reef is a living animal and just like any living creature it has the right for the chance to live without disease. Losing the coral reef will mean great loses in the field of marine biodiversity. The hundreds, if not thousands of different species that the reef holds will be lost.